Woodpeckers usually belong to people’s favorite birds. Perhaps it is their striking color combinations, their active foraging habits or their ability to knock impressive holes into hard tree trunks. How knows. From my first hand experience as a bird watching guide, I can confirm, that sighting of a woodpecker is always somewhat special. A moment which always seems to cheer everybody in the party up. In our region, woodpeckers are not scarce. The most frequently seen species is likely the Golden-cheeked Woodpecker (Centurus chrysogenys), which I described in one of my previous contributions. The Pale-billed Woodpecker, a much larger species, in fact one of the largest woodpeckers on the planet, is a bit harder to find. The overall color of the bird is black, with a striking white V-shaped mark on the back. Its head is red. Its underbody is barred black and white. In most of my sightings, if not all, I could observe both the male and the female foraging together, keeping in contact by frequent vocalization. 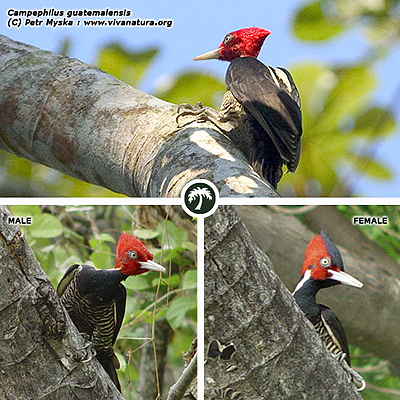 Both sexes are of the same size and the only distinction in between them is a presence of a black frontal stripe running from the top of the head to the base of the beak in the female. The males head is uniformly red (see photo). The Pale-billed Woodpecker’s life history is tied to trees. It is where they find their food – insects, and construct their nests. Therefore loss of the large forest trees inevitably means disappearance of this species from the area. C. guatemalensis can be found on both Mexican coasts, from Tamaulipas and Sonora, south to W Panama (Howell and Webb, 1995). * NORMA Oficial Mexicana NOM-059-ECOL-2001, Protección ambiental-Especies nativas de México de flora y fauna silvestres-Categorías de riesgo y especificaciones para su inclusión, exclusión o cambio-Lista de especies en riesgo.